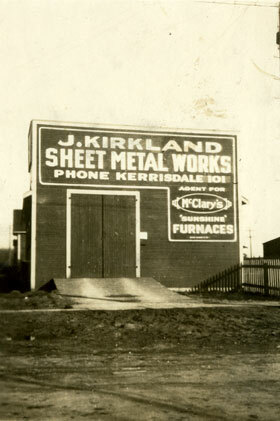 In 1921 John Kirkland opened a business, which soon became known as “Kirkland’s Metal Shop” because Mr. Kirkland would fabricate from metal almost everything needed for a home, whether it was metal flashings, gutters, or the sheet metal to make a furnace and its ductwork. The business quickly became very well known for its expertise and integrity with anything to do with heating, ventilation, and air conditioning. Our history of expertise in heating and ventilation design and fabrication makes us an ideal “one stop shop” for any modification to your heating system or a new heating and cooling system for your new or existing home. As heating systems changed from wood, coal, and sawdust fuels to oil and natural gas, the furnaces became more automatic. Thermostats were introduced and basements became less of a place to store your fuel for heating and more of a place to expand living space. As the heating equipment became more technical in nature, the homeowner began to rely upon the expertise of the local heating company for repairs and maintenance.